To take the Montaña Blanca walk, you need first to get yourself to a "Visitors' Centre" called El Portillo. 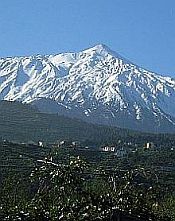 This is found on the TF-21 road through the Teide National Park, up at its northern end. If you have a hire car, you can, obviously, drive yourself there, the journey from the southern resorts taking well over an hour, but there are also bus services - number 342 from Las Americas, via Los Cristianos and number 348 from Puerto de la Cruz. 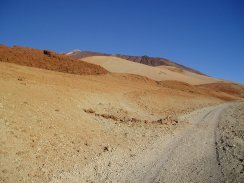 El Portillo is open from 9am to 4pm every day of the year except Christmas day and New Year's day and has exhibits showing the geology of Teide and the National Park. There are also car parking facilities. You can obtain a guide map from El Portillo, but, in this case, the walk is very clearly signposted and easy to follow. You'll see a large sign at the start of the walk, with a map of the route. 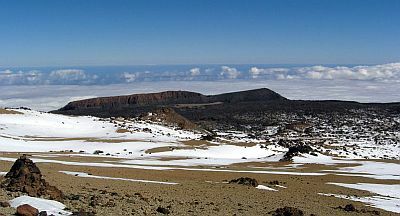 The Montaña Blanca walk is a good starter for inexperienced walkers. 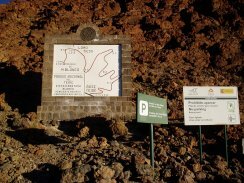 The trail you set off on is well marked, as it is also used by jeeps, driven by the Teide park rangers. As you proceed along the slowly ascending path, the landscape begins to unfold all around you. The first place you'll reach is a viewpoint, which gives fantastic views of the north east of the island plus the north side of Las Cañadas, featuring the La Fortaleza cliffs. 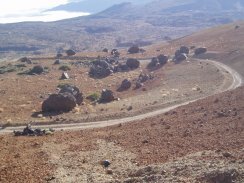 The trail zig-zags on up the mountain and you will see theHuevos del Teide, or "eggs of Teide", which are huge round basalt boulders. They were ejected during an ancient eruption and broke off from the main lava flow. In the midst of this barren terrain, watch out for small clumps of the Teide violet. Give yourself a pat on the back if you do - they're quite rare. Eventually, you'll come to a path leading off from the main trail. This is the way to the summit of Teide and is clearly marked as such. The sign will also warn any hikers intending to take that route that they may only do so with the appropriate permit. You don't need a permit for Montaña Blanca! Follow the small green sign marked "Sendero 7" and keep to the wide trail. As you reach the mountain, the trail forks in two, to encircle it and you can chose which way you go. The summit affords superb views of the National Park and its surrounding "lunar landscape". To complete the walk, just retrace your steps, back to your starting point - downhill! This is a good starting walk of some 4.5 miles. During it, you ascend gradually some 1650 feet. Best in summer. In winter you could encounter snow and dense mist. El Portillo Visitors' Centre contact number: (+34) 922 290129.